In this post, a WPF application using MVVM is created and used to send and recieve SignalR messages. SignalRClientWPF: Our WPF application, contains mainly views. SignalRDataProvider: Data Provider for the SignalR service. The assembly is an implementation of the ISignalRHubSync interface with all the methods required by the ViewModel to send and recieve SignalR messages. The interface is defined in the Portable library so that it can be used by Win RT or Win PRT applications. 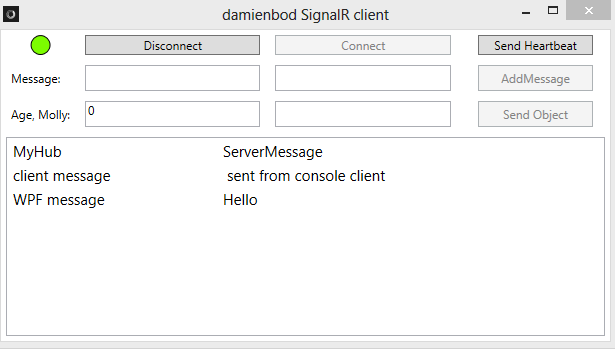 The SignalRHubSync uses the WPF Model objects for recieving and sending messages. The _myHubClient instance provides access to the SignalR Hub Proxy. When a message is recieved, it is simply passed on in the same thread using the defined events. The MyHubClient class implements everything required for the Hub client proxy. The class also implements the helper interfaces provided by the Hub common assembly. The MyHubClient class implements the abstract class BaseHubClient. All common methods which could be used for a second or third Hub are defined here. The ViewModel and the Model for the MVVM pattern are implemented in this library. This library can be reused for Win RT, Win PRT or .Net applications. All model classes implement the Observable class. The PropertyChanged events are defined in this class. The ICommand interface is also implemented in this library. This can then be used to send and bind events from the GUI. All view model classes should also be implemented in the portable library. No references to .NET or platform specific code can be defined or used. In the demo application, only one ViewModel is implemented (for the MainWindow View). In this view model, the interfaces ISignalRHubSync , IContext are added to the constructor. The class is then easy to unit test. The view uses this as its DataContext. A nice seperation of concerns now exist between the View and the viewModel. This is the WPF application. The views are implemented here. The MainWindow view contains all the logic in this demo application. In the code behind, the DataContext is initialised. This class is very light. A special helper class is required for the SignalR incoming events. This class passes the SignalR events to the UiThread. /// Initializes the framework using the current dispatcher. /// Executes the action on the UI thread. A ColorToSolidColorBrushValueConverter class is also used to convert the connection state so the Ellipse Fill property can be binded to this bool value. // For a more sophisticated converter, check also the targetType and react accordingly..
// get its Color-value and return it. The application source code can be downloaded from gitHub. Unity could easily be used as a IoC for this application. Semantic Logging is used as a logging framework. Now a WPF application using MVVM can push and pull messages from a SignalR Hub. Thanks for Posts on SignalR. Am i missing anything? I am using VS 2012 + .net 4.5. Even googling didnt help me so posting here. Hi, i cannot reach to find the source files for SignalRDataProvider project. I the github repository they are missing. What am i wrong ?? thanks for the reply, but in your github repository there’s only 3 projects: ClientConsole, ClientWPF and ServerConsole. The SignalRDataProvider’s project is missing. I wasn’t looking in the subfolder. If i compile and run all works fine until i try to invoke the AddMessage from that client. When u do that i get a TypLoadException. I’m sorry but in my previous message i missed some words. As additional info, if i move the declaration of Heartbeat() from base interface to ISendHubSync all works fine. Let me know if you cannot reach to replicate the error with typed hub. I have upgraded to the latest version of SignalR and everything is working. I havn’t refactored anything yet, don’t understand why splitting the interfaces should cause a problem. I’ve change the Hub to a strong Tpye Hub and it’s also working, I had the change the messages on the send and the clients addmessage => AddMessage, The a needs to be toUppercase. because this seems to be a SignalR design issue.